One of my goals as a parent is to make sure my children know great pieces of literature. I don’t just want them to read the book and move on, I want them to really know the literature. 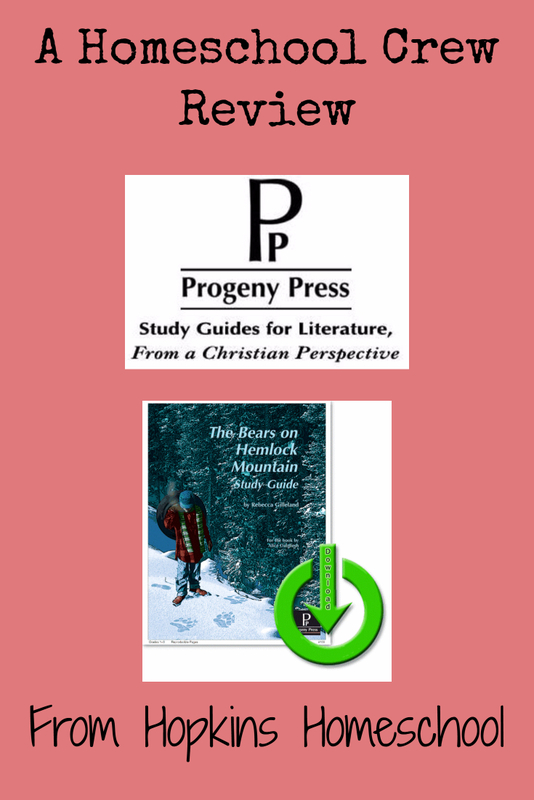 Progeny Press is a great company that provides study guides to these great pieces of literature, helping your child really know all about the book. We had the chance to check out The Bears on Hemlock Mountain E-Guide. 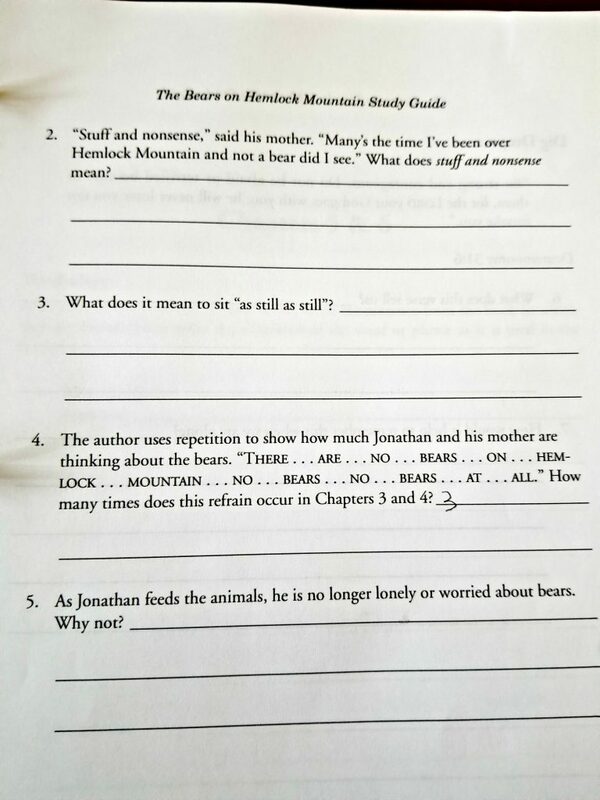 This study guide for The Bears on Hemlock Mountain is geared towards grades 1-3. You will have background information, Before-you-read Activities, vocabulary and questions for the chapters along with fun games and activities to complete after you have completed the book. This is just what I was looking for when I said I wanted something to help them really know the great pieces of literature! After receiving this E-Guide, I took the time to read the Note to Instructor. While I have used these guides before, I wanted to refresh myself and make sure nothing had changed. After the note, I found a Synopsis of the book. This is great, because, while I have heard of the book, I had never actually read it yet. This gave me an idea of what Ray Ray would be reading and learning about. Finally, I found an About the Author section as well as some background information about the book. We were finally ready to start! Well, sort of. First, we needed to have some fun with our Before-You-Read Activities. There were six activities listed for us to pick from. We could do them all, or just one, or as many as we wanted. There is nothing stating that we even needed to do any before we started out reading. I had Ray Ray work on a few of these, including listening to birdsongs we found online and checking out different pictures of animal’s tracks. We hadn’t had a lot of rain during this time, so finding actual animal tracks didn’t work for us. Now, we were ready to read! We had an idea of a few things we would be reading, and also what Jonathan may have been hearing and seeing in the book. I figured that we would do our reading over a day or two, following that up with a day or two of the study guide. I found out rather quickly that Ray Ray’s reading level was way above this book, so we did the reading in one day instead of two. However, his willingness to work on writing or questions took us about three days instead of two. The first day after reading our chapters, we spent time on the vocabulary section. This ranged from section to section, sometimes we would tell what a word meant in a sentence, other times we would simply match the word to the definition. Each time it was different, but it kept us on our toes and the boring routine wasn’t there! Questions followed the vocabulary. These are comprehension questions that make us think about what we read. Not just who did what and when, rather, deciding how characters reacted by the words we were reading. Trying to figure out if something would have been difficult for Jonathan and why or why not. These questions dig deeper and make us look at the book a little different. Some of the questions would also include Bible verses, relating the story and the Bible to each other. These questions also help to bring the story, the Bible and what the kids face all together as one. After we finished our reading, we had the chance to check out After-you-read Activities. 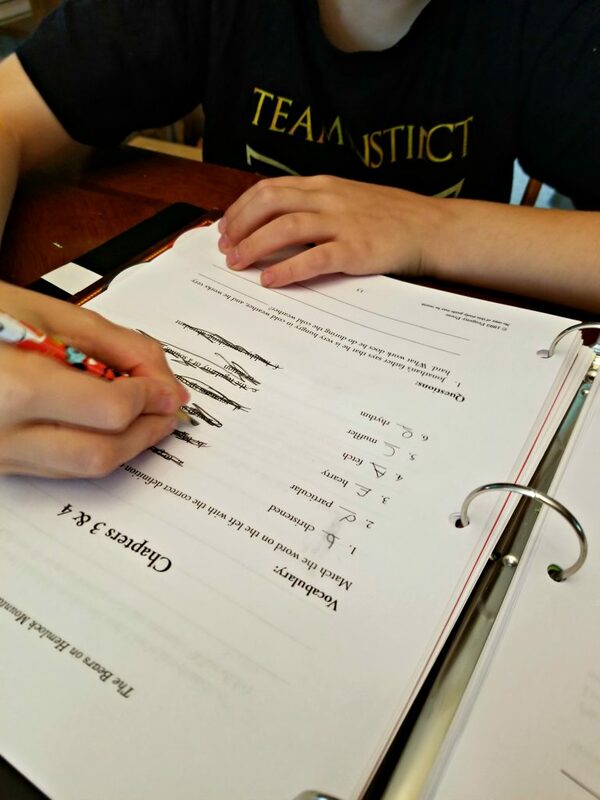 Once again, you can decide how many if any that you would like to include in your homeschool. Ray Ray ended this book, by learning a little more about bears and hibernation. After he spent time learning about this, he was able to take his notes and tell mom, dad, and the two little sisters more about it in an oral report. I loved this study guide! I loved how easy it was for me to use. There was little prep needed, other than the before and after you read activities, and this was only if you wanted to do the extras. I loved the depths of the questions. While they aren’t extremely hard to figure out for the 1-3 grades, they do require thought to be put into it. The writing place is large enough for their handwriting level. There was plenty of room to write the answers in. Now if I could just get Ray Ray to not fuss over writing and just do it, it would be better for me! Because Ray Ray does not like to write that much, I did alter some of the work in the question section. I would allow him to verbally answer half of the questions while making him write the other half of the answers. This helped him through some of the battles, which made me happier. Ray Ray didn’t like the writing of this study guide, but he loved the book and was happy to verbally answer the questions. I watched him actually slowing down and thinking about the answers, this alone was all that I was worried about. I don’t care if he can write it, I just care that he is thinking about it, and he is! Progeny Press has many study guides for many ages and books. Check out a few more of them here from other members of the crew!